Western blot analysis of SK-N-MC and A549 cell extracts using MAFB Antibody (upper) and β-Actin (D6A8) Rabbit mAb #8457 (lower). Immunoprecipitation of MAFB from SK-N-MC cell extracts. Lane 1 is 10% input, lane 2 is Normal Rabbit IgG #2729, and lane 3 is MAFB Antibody. 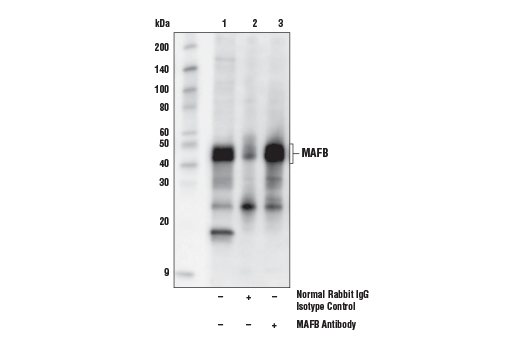 Western blot analysis was performed using MAFB Antibody. 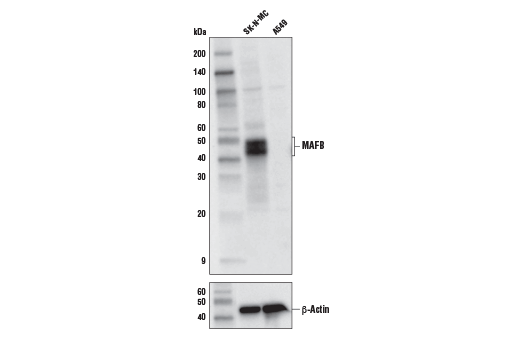 MAFB Antibody recognizes endogenous levels of total MAFB protein. Based on sequence similarity, this antibody is not predicted to cross-react with MAFA. Polyclonal antibodies are produced by immunizing animals with a synthetic peptide corresponding to residues surrounding of human Pro188 protein. Antibodies are purified by protein A and peptide affinity chromatography. MAFB belongs to the musculoaponeurotic fibrosarcoma (MAF) family of basic leucine-zipper transcription factors (1). In mouse embryo, MAFB expression is first detected at E10.5 (2, 3). Early in development, MAFB drives differentiation of both glucagon-producing α-cells and insulin-producing β-cells in the pancreas, but later plays a more decisive role in the maturation and maintenance of functional α-cells (4, 5). Consistent with MAFB playing a critical role in mature α-cells, MAFB is enriched in α-cells within 2 weeks of birth in the pancreas (6). Glucagon and insulin secretion is tightly regulated, and imbalances in these hormones contribute to metabolic conditions. Therefore, understanding the role of MAFB in α-cell development, maintenance, and physiological function may contribute to developing deeper insights into how these cells contribute to metabolic diseases like diabetes. MAFB also regulates monocyte differentiation, indicating MAFB functions beyond the pancreas (7). Hang, Y. and Stein, R. (2011) Trends Endocrinol Metab 22, 364-73. Nishimura, W. et al. (2006) Dev Biol 293, 526-39. Artner, I. et al. (2006) Diabetes 55, 297-304. Katoh, M.C. et al. (2018) Mol Cell Biol 38, . Artner, I. et al. (2007) Proc Natl Acad Sci U S A 104, 3853-8. Artner, I. et al. (2010) Diabetes 59, 2530-9. Wu, X. et al. (2016) J Exp Med 213, 2553-65.